My name is Ryan K. Collier. 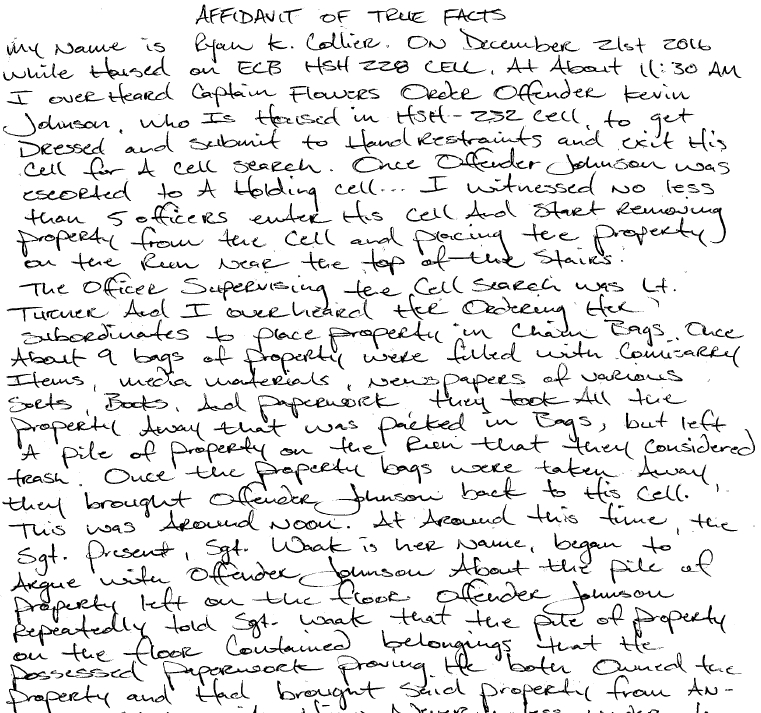 On December 21st 2016 while housed on ECB HSH 228 cell at about 11:30 AM I overheard Captain Flowers order offender Kevin Johnson, who is housed in HSH-232 cell, to get dressed and submit to hand restraints and exit his cell for a cell search. Once offender Johnson was escorted to a holding cell … I witnessed no less than 5 officers enter his cell and start removing property from the cell and placing the property on the run near the top of the stairs. The officer supervising the cell search was Lt. Turner and I overheard her ordering her subordinates to place property in chain bags. Once about 9 bags of property were filled with commissary items, media materials, newspapers of various sorts, books, and paperwork, they took all the property away that was packed in bags, but left a pile of property on the run that they considered trash. Once the property bags were taken away, they brought offender Johnson back to his cell. This was around noon. At around this time, the Sgt. present, Sgt. Waak is her name, began to argue with offender Johnson about the pile of property left on the floor. Offender Johnson repeatedly told Sgt. Waak that the pile of property on the floor contained belongings that he possessed paperwork proving he both owned the property and had brought said property from another state with him. Nevertheless, under the supervision of Sgt. Waak the SSI inmate assigned to the ECB facility for cleaning purposes was ordered to gather the pile of property and dispose of it as trash. At around 12:20 pm, offender Johnson was ordered to relinquish hand restraints and offender Johnson repeatedly stated that he was not refusing. I watched as Sgt. Waak and her subordinates sprayed chemicals into offender Johnson’s cell and while recording these activities on camera. I heard offender Johnson requesting to have fresh air to breathe, and to be decontaminated and to have his cell decontaminated. These requests were denied. I also repeatedly heard offender Johnson request use of force paperwork. These requests were not granted. I witnessed the male officers laughing and smiling and jesting during these proceedings. 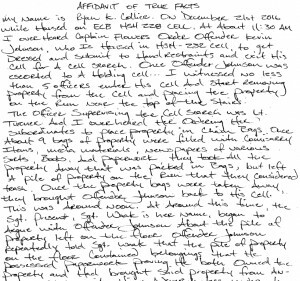 After these incidents, numerous offenders housed on the HSH section of ECB requested incident sheets, grievances and incident reports, in order to document what they saw and heard during these proceedings. These requests were denied. Furthermore, I would like to state that I have seen Captain Flowers threaten to confiscate offender Johnson’s property in the days leading up to the incidents recorded above. Under penalty of perjury, I swear that this affidavit contains true facts, and that I have voluntarily provided these facts of my own volition and free will. I have not been threatened or offered payment in exchange for my testimony. To view a scan of the original statement by Ryan K. Collier click here.